Eartags are "nameplates" which are attached to the ear flaps of cattle and buffaloes. 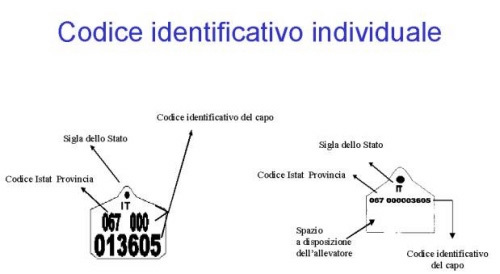 The tags carry an individual identifying code which identifies each animal and which refers to the unique holding code which is assigned, by the competent Veterinary Service for the territory, to each holding: farms, housing barns, genetic centres, collecting centres, markets and pastures. Eartags, two per bovine animal, are made of flexible plastic, tamper-proof and easily legible throughout the animal's life. The tags are not reusable, must remain fixed without harming the animal, and are yellow or salmon pink for animals entered in the herd books. Each tag is made up of two parts, male and female, which carry the individual identification code on the visible surface. The eartags, right and left, are attached to both the ears of the bovine animal, in a central position, in the space delimited by the course of the two veins of the external ear, in order, as far as possible, to avoid damaging them by tearing or detachment. Rearers may choose the make and model that they consider most appropriate among those certified by the suppliers authorized by the Ministry of Health; they must take care over the method of attachment, and provide themselves with pliers suitable for the type of tag used. The keeper of the animals can order a quantity of eartags not larger than the annual requirement for the individual holding. The keeper, or a person delegated by the keeper, orders the required quantity of eartags by connecting to the National DataBase by means of a suitable function, and indicating the authorized supplier with whom the order is to be placed. The Veterinary Service verifies the appropriateness of the order and authorizes the production of the required eartags. 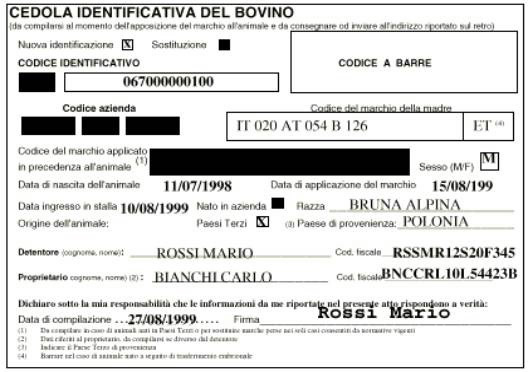 The supplier receives the authorized order from the Veterinary Service and proceeds with the production and despatch of the tags with the identification code, sending them to the requester with the cattle Identification Form which will have to be completed by the rearer at the stage of identifying the animal.